Are you planning to update or redesign your website? Today, more than ever, your website needs to appeal to the needs of a customer visiting your website on a mobile phone. In June 2013 alone, 7.5 million Australians accessed the internet via mobile phones according to ACMA. And this number is set to rise. It is also a rise of over 33% on the same month just one year before. Imagine a world where about half of your website visitors are coming of their mobiles. Obviously, these screen sizes and resolutions are much smaller than your average Mac or PC, and so your website needs to accommodate for them. Responsive Web Design is the process of creating websites that automatically resize the pages to fit efficiently on the screens of a mobile or tablet device. Today’s consumer wants ease of use, a logic flow of information, and clean, and easy to read websites – and this is close to impossible when they’re trying to pinch, and resize your non-responsive websites. Websites that are not responsive are common for those older than 4 or 5 years old. Obviously the growth in the amount of people with smartphones and tablets have driven the need for companies to respond to this emerging trend. In June 2013 alone, 7.5 million Australians accessed the internet via mobile phones. How can I tell if my Website is or isn’t responsive? Does your business website require pinching or scrolling when viewing on a mobile? Does the content collapse into a logical, readable format when you change the window size on a desktop? A non-responsive non mobile web design will effectively cut off your content when you change your window size. It will also require a lot of work with pinching and scrolling when viewing on a mobile. 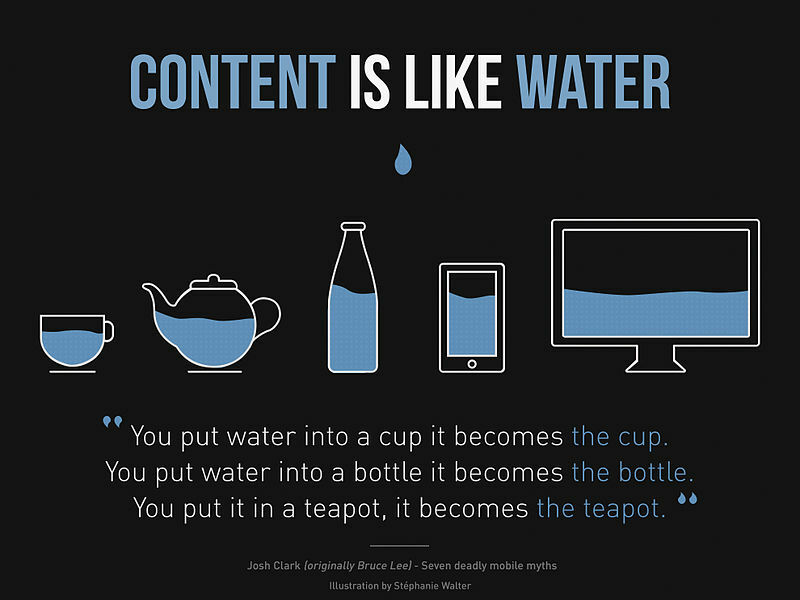 Content is like water, you put it into a cup, it becomes the cup. You put it into a bottle, it becomes the bottle. You put it in a teapot, it becomes the teapot. This is a good use of metaphor. Essentially, it explains that responsive web design allows content to show logically across a number of different sized screens. Invest in going responsive with mobile web design, and your business will never look back. Webtron builds all our sites using responsive mobile web design principles. Contact us today to see how we can help your business.